Last june I blogged about the forthcoming production of Frank McGuinness' play 'Observe The Sons of Ulster Marching Towards The Somme’ by the prisoners at Hydebank Wodd YOC in Belfast. It was shown on BBC 1 in March after the original schedule was knocked back. The rehabilitation of offenders is something which I fundamentally believe in, I loathe the lock them up and throw away the key attititude which many in the right-wing press like to espouse. I thought this was a useful documentary to help those of you out there understand the backgrounds and reality of the young men who end up in places like Hydebank Wood YOC. I have had to visit someone in this prison and its not a nice experience, but the compassion and understanding of the staff is something which helps make a difference. 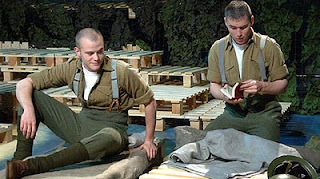 As someone who has a close relative who died at The Somme, I found the production moving and special. Dan Gordon and the Prison Governor deserve credit for sticking by this project and for allowing it to proceed. The BBC link with more details on the programme can be found here. Update: An interview with Dan Gordon in the Belfast Telegraph.